Being in Miami for a few days on business, I had to take the opportunity to get out and see this art deco landmark. After work on Friday afternoon the group of us decided since we were in Miami and had never been before we needed to mark off another of the 1000 places to see before we die. 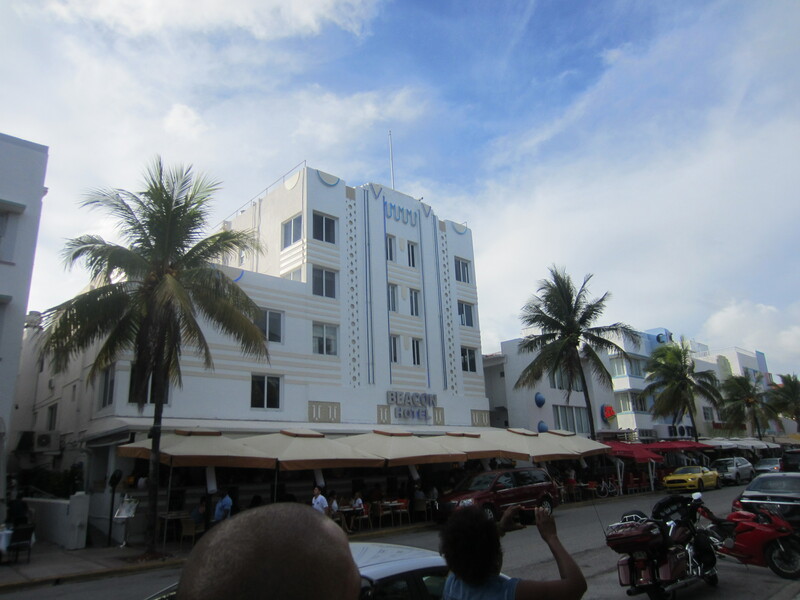 We headed to Ocean Boulevard and the Art Deco District, AKA South Beach. This might be one of the most interesting places I have been and one of the most disappointing. Having only a few hours I parked in a garage close to Ocean Drive and headed out to see what kind of adventure this would be. There are two or three reasons to go to South Beach. The first is of course the beach. The beach is wide and a flat gentle slope of sugar sand that transitions to the deep blues and turquoise greens of the Atlantic Ocean. 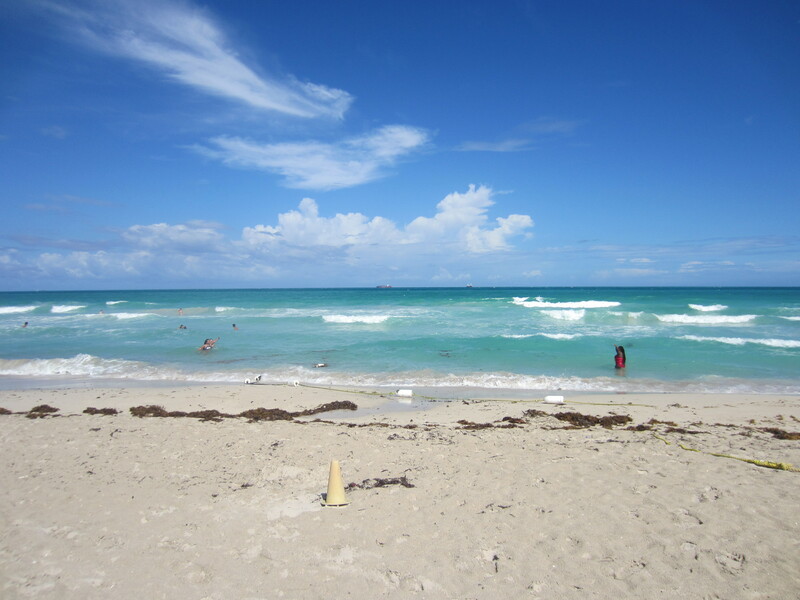 South Beach’s beach is a free public beach, beginning at Ocean Drive and 5th Street and stretching up to 21st Street and Collins. I September the water was still warm and even though school had started there was plenty of people on the beach for the life guards to look after. The beach part of South Beach completely lived up to my expectations. It is beautiful with palm trees in the background, the blue of the water and the gentle sounds of the ocean. Right behind much of the beach is Lummus Park. This is a public beachfront park on Ocean Drive, between 5th and 15 th Streets. When you see South Beach in the movies or on TV, the scenes with folks roller blading, biking and walking are in this area. This park fills the area between the beach and Ocean Drive. Again this is a great space for walking and people watching. This park is the best place to view the art deco architecture that South Beach and Ocean Drive are so famous for. Just strolling up the street it is easy to imagine yourself back in the 1920’s or 30’s headed out for an even on the town. The art deco district really comes alive after dark when the neon can shine. I say to view the buildings from the park, because if you cross Ocean drive and try to walk next to the buildings for an up close look you really cannot see anything. This was one reason I said I was disappointed. The second reason is walking down the side of the street with the buildings you are constantly bombarded with offers of “two for one beer”, or “the best food on Ocean Drive”. So much so it just is not enjoyable. Our group finally bit on one of the “two for the price of one beer” offers, and that really turned out to be a stupid decision. We found out that the beer was 32oz and the price of one was $30.00. 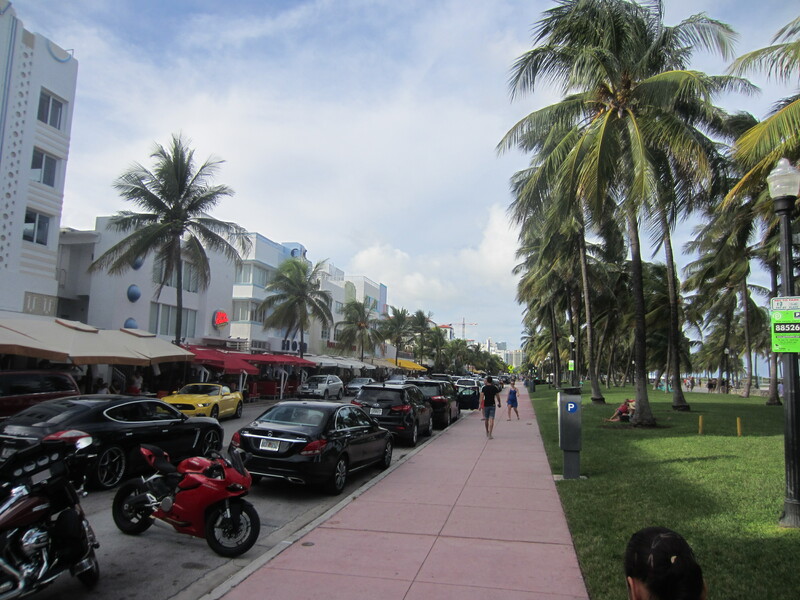 The East West Side of Ocean Drive is pretty much a tourist trap. If you want souvenirs, check out the Official Art Deco Gift Shop – Miami Design Preservation League. They had some really cool stuff and it supports the preservation of the art deco district. So go to South Beach for the beach and for the architecture. Hangout in the park and people watch. I would avoid the crowed and expensive East side Ocean Drive. I visited Miami almost a year ago, for the first time. It wasn’t really my cup of tea, although I rate a place where you can visit the beach all year around. That is true, that can be very entertaining on Ocean Dr.
I’ve never been to Ocean dr, so thanks for tip about avoiding the East side. I would agree with your analysis of South Beach. You are correct! Thanks, I will fix that!! This is exactly what we did when we went to Miami for the first time! We went to see the famous Art Deco buildings and that beach. Beautiful beach but some of the buildings were a bit rundown looking. So many people out and about people-watching was great fun.